Did you ever heard about the White Dinner? This is a truly amazing event organized in several European cities during summer (check some pictures of the one in Paris here). 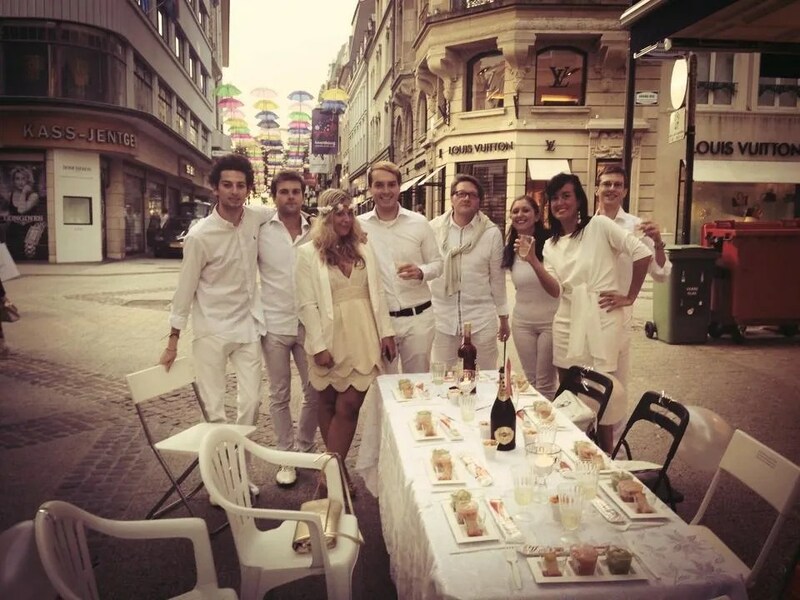 The rules are more or less always the same: the dinner is taking place in a public place that is kept secret till the very last, everybody should be dressed in total white and you must provide for everything for your group (table, chairs, food, etc.). It is actually less complicated than it looks and having been to four White Dinners in Luxembourg already, I can ensure it is definitely worth the effort – and each and every year you want to improve! It is just important you try to plan a bit in advance the event and to share the tasks with your group of friends. Keep the group limited, above all if you are inexperienced. A table of 4 or 6 is easier to manage and you won’t feel overwhelmed. 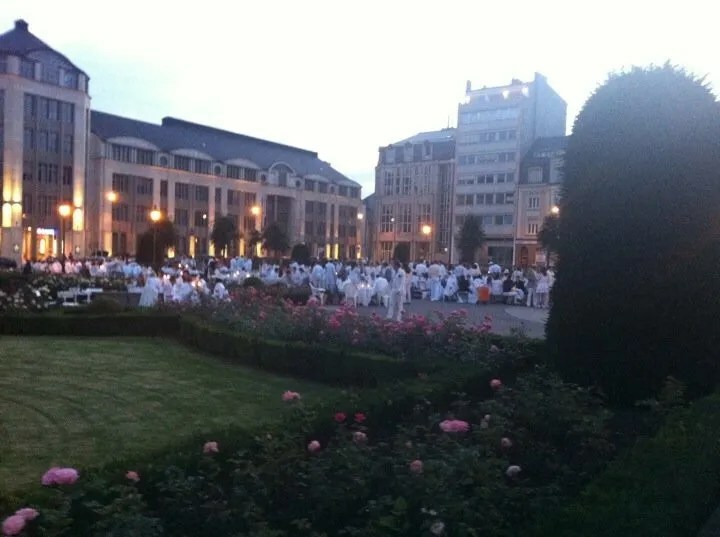 Previous White Dinners in Luxembourg took place among all at the Roses Garden in front of Arcelor Mittal building, in Rue Philippe II, on the Corniche. 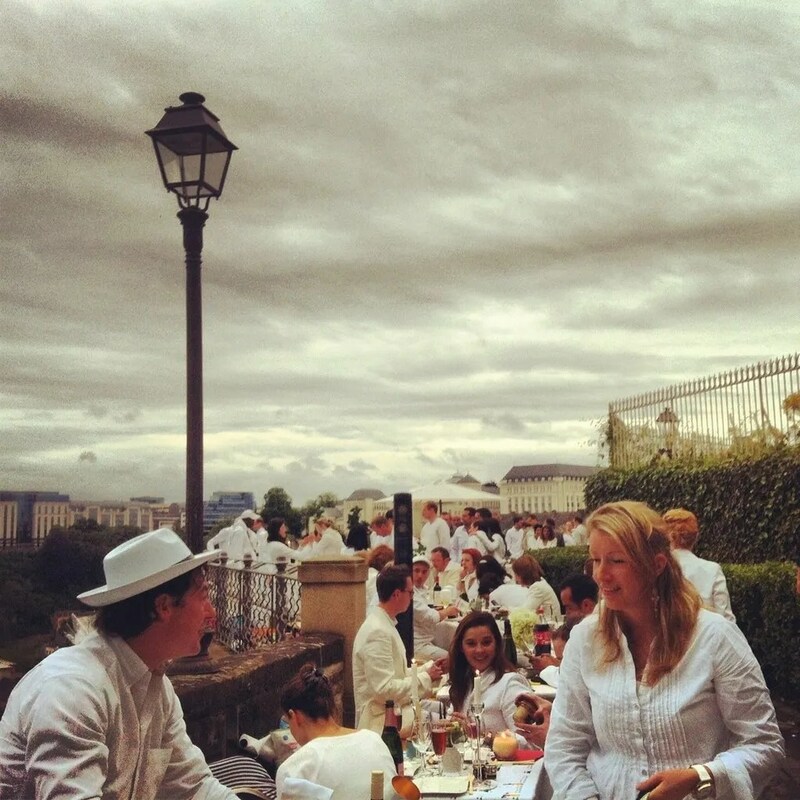 – Normally you receive indications regarding the “meeting point” ahead the White Dinner day. The “meeting point” is at a walking distance from the place where the White Dinner will actually take place. Therefore, start to wonder where the dinner could be and above all try to find the closest parking place/bus stop. You can share the easy things to transport with your friends (have backpacks, boxes and cooler bags ready and filled). Have just one friend with the car that could move heavy stuff and tables when the place is announced. Use foldable tables and chairs for garden that are light and easy to clean. – If you are afraid of taking china with you, check at shop like Hema or Ava, in Luxembourg city. They have wonderful catering items at small price and some nice decoration solutions. – Coordinate the food and the drinks, to avoid ending up with ten red wines bottles and nothing else. Take in consideration that, from the announcement of the “place”, it takes some time to arrange the tables and collect people, so be ready with an icy cold champagne bottle or a nice aperitif for your friends, while you are setting your table. – Go cold (pasta salad, raw fish, cheese and charcuterie) and simple (what about a bento box for your friends?). If you are afraid is going to be too complicated, you might consider to take something take away (Sushi shop box, for example). – If it is your first year, don’t bother too much about the appearance. Try to be clean, have a nice organized table and above all to enjoy. You might see crazy stuff that night, like people having their own butler carrying them stuff around, but White Dinner is not about the best table. It is about having a different special night, about a secret place, about being thrilled of organizing something with your friends and enjoy this special and lovely moment. Next > Do you know MixinLux? Wow, thanks for this info!!! I know about the white sensation parties but never heard about this dinner. Wow, looks like a fun event. I had never heard of it before. Hope to see you there! It is next Friday 17th! Hello – it is going to be next week in Luxembourg city! Hi Corie! Thanks for the info! But I cannot see the adress to which we have to send an email! Oh what a pity! It is a really great party! Just send you a quick message on FB Yan! Send me a message on FB and I will try to help you out! 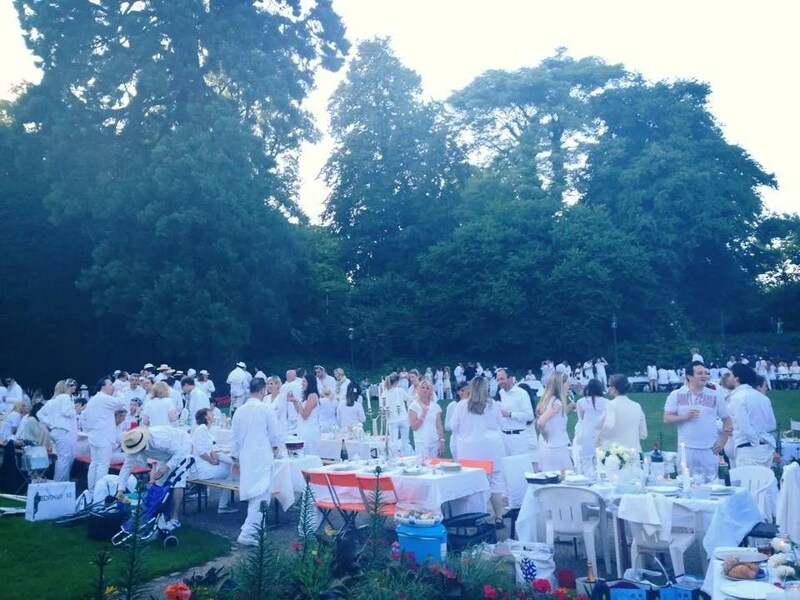 I have always wanted to attend this ‘white dinner’. I think the concept is by far the best to meet old friends and other people from your country (as everybody knows ever body from somewhere) . I’ll try to attend the next one, has a day already been set ? Yes Jenny, send me a PM and I will give you the details, they cannot be make public! Hello Fernando try to write to Mrs. White on FB.